WarStrike: The M42 Project: A Great Weekend of Testing! The only "meh" I got was from a Flames player who was impressed by the mechanics, but just wasn't that into 28mm scale games. A similar majority of those I did a quick gameplay rundown with were really excited by what they saw, and expressed an eager desire to follow the project's progress. Three of those very much want to do a demo in the future, but didn't have the time this weekend. I have another 3 local players who wanted to come, but couldn't, and we'll work out times for demos in the next couple of weeks. Results like these are extremely encouraging, as we hadn't really done much testing in the last couple of years. CaulynDarr and I were pretty sure that WarStrike's floating-initiative mechanics were fun and unique, based on our in-house testing. But to see new players taking to the game immediately, with jokes being made, and cries of joy on making difficult 10-up die rolls, really validates all of those hours that I spent honing the rules between family emergencies and other depressing setbacks. There have been a lot of times that it would have been quite easy to use one of those as an excuse to drop the project and move on to something else. But now I'm very glad that I didn't! This game really does stand on its own. Ok, so... Warm fuzzies aside... What did the testing uncover? A full game takes between 1 and 1.5 hours. While the half-games we played (three units each instead of seven) took between 30 and 45 minutes. The number of turns ranged from 4 to 8. For experienced players in a tournament environment, games should average one hour. So if a TO does 90 minute rounds, that should enable FIVE game rounds, plus an hour for lunch, in a tournament lasting from 10am to 6:30pm. Awards at 7pm, and you're on your way by 8pm. Not bad at all! And five rounds will enable true single-elimination win/loss scoring for 32 players. Add three more rounds on a second day, and we're talking 256 players with single-elimination for large events like NOVA or Adepticon. Awesome! The fast pace of play was also a BIG draw for all of those playing and/or watching the test games. Considering that my most recent "small" 8th Edition 40K game (Guard vs. Necrons) ran 3.5 hours, this is again becoming a big deal, even to casual 40K players. As I was spending the time between tests texting with potential testers, one of them was very keen on being able to test the game using their own GW Ork models, and disappointed when I said I was providing the armies. The games that I've been running have used my own collections of models to represent Republic/Fallen forces. Basically Space Marines with light infantry units attached. 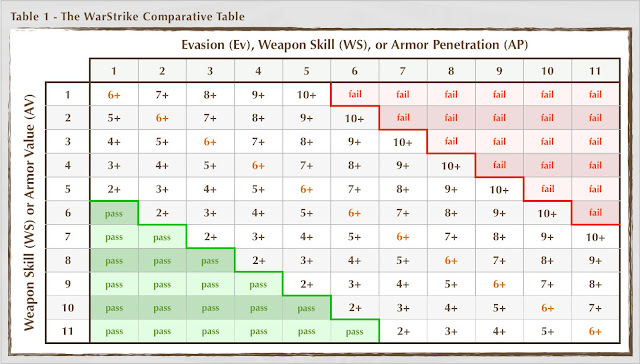 So... As the pool of testers widens, we'll need to come up with baseline unit/weapon stats for all of our factions. 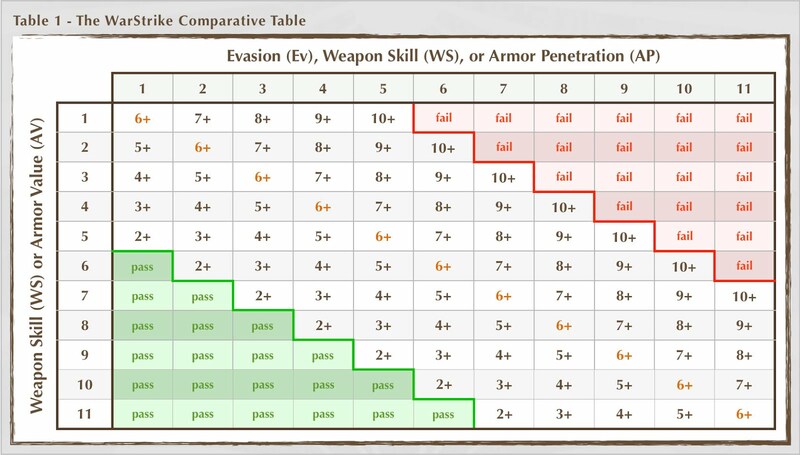 Not full unit cards or point costs, or even special faction rules, but something that gives potential non-marine players the ability to slap some weapons and gear on a given stat-line, and throw down a test game with what they have. Some players (and potential players) admitted that they didn't have more than a couple of D10's in their collection, but everyone I played or talked to was very receptive to using them. Some players even actively hated D6's. Maybe this shouldn't have been surprising to me, but it was. One guy picked up the book, flipped through it a bit, and immediately told me that I should not, under any circumstances, change the comparison table. Why? Because once he saw it, he didn't need to look at it any more. He could work it out easily in his head. If the two stats to be compared are equal, the roll you need is a 6+. So if you're comparing two unequal stats, you first figure out the difference. You then decide if the difference is good, or bad for you. If the difference is good for you, walk down from 6 by the difference. If the difference is bad for you, walk it up by the difference. So if your WS 5 Conscripts are shooting at Evasion 7 Marine Light Infantry, there's a difference of two, and it's going to bad for you. So you walk up your roll from 6 by 2 points. "Six... Seven... Eight." You need an 8+ to hit. If your WS 9 Fallen Captain is trying to hit an Evasion 5 Marine Legio, then there's a difference of four, and it's good for you. So you walk down your roll from 6 by 4 points. "Six... Five... Four... Three... Two." You need a 2+ to hit. Players really liked the fast 2D10 test to be able to pick one or two of your opponent's casualties. But every time I told them to roll it, there was a few seconds of confusion. If instead of "Roll to pick who dies," I'd said something more like "Roll your Reaper Test," I think it would have helped quite a bit. Of the five test games that I ran, three of them involved significant amounts of melee combat. Something that hadn't really happened in earlier testing. As a result, it became immediately apparent that the rules for "ganging up on a model" and "Watching Each Other's Backs" weren't needed. Since I couldn't remember these rules, and I could see how much the players were enjoying the pace of the game, I decided to not even bring them up. They would have stopped the rhythm of the action as we figured out who had what WS modified or not. Besides which, combats were interesting enough. What do I mean by that? Well... Since melee only affects models that are engaged by an enemy, we had some very interesting situations develop. Such as where one model in a unit of light infantry was charged, and the rest of the unit left him, and relocated someplace else to fire at another enemy unit. Because the unit leader wasn't engaged, and so he could move the squad away so long as at least half of its models were able to come along. 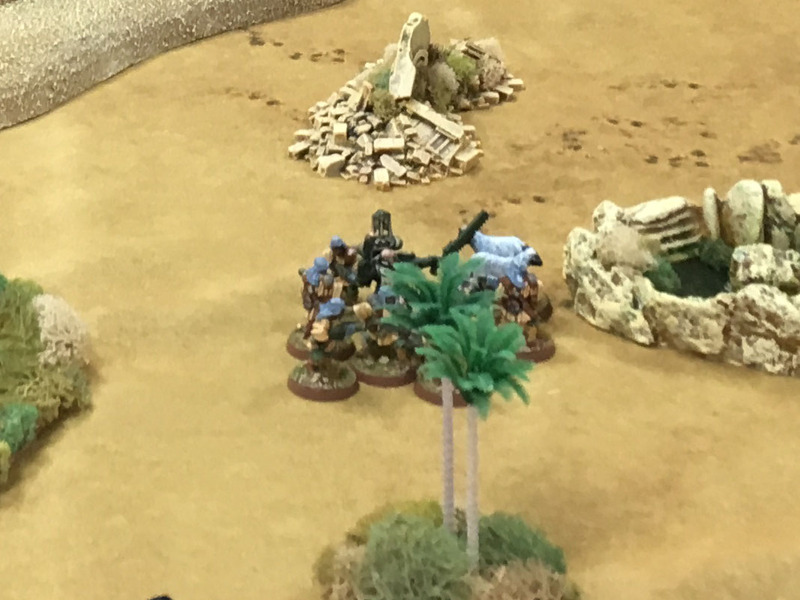 Versus another game, where the opponent (me) did charge the unit leader of a Marine squad, and so the unit was stuck in combat. This was all much more interesting than 40K combats, while being an emergent property of the basic rules for the movement and action phases. I really need to consider, and tighten up, the rules for charging and melee. So that it's clear that an engaged unit has to charge if they want to "consolidate" into combat. This is because stunned models (those with a toughness that survived a wound) are automatically killed if charged. But it wasn't clear what would happen to a stunned model if it was simply attacked in melee. The best thing would be if you can't attack a stunned model in melee. So that the unit has to declare a charge in order to finish the stunned model(s) off. 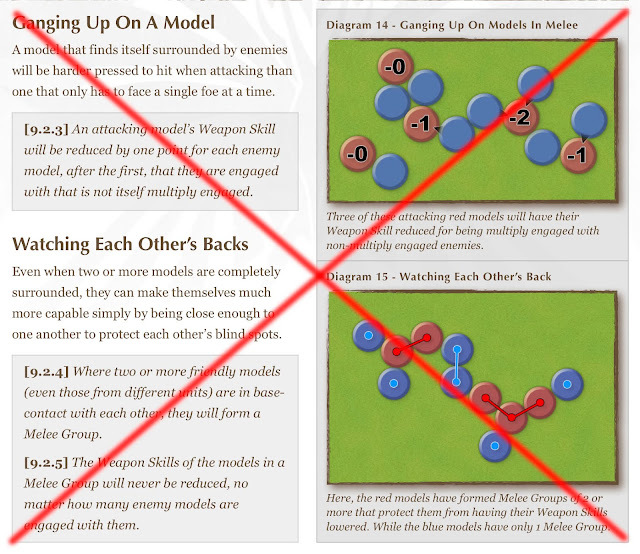 That way being stunned isn't an automatic kill in melee, and a unit (or a lone Commander) has to choose between taking an extra turn to finish off a stunned model, or leaving them lie so that the unit can do something else. Like hoofing it to a nearby objective. Doing an auto-hit, auto-pen, with a kill test required might work if we did allow an attack. In that weak units are unlikely to succeed, and so must charge in order to be sure. While stronger melee units could probably trust that whoever they left behind in combat could finish off stunned enemies. There are also implications for pinned units. In that they're automatically destroyed if charged, but it's currently fuzzy as to what happens when they're in combat. 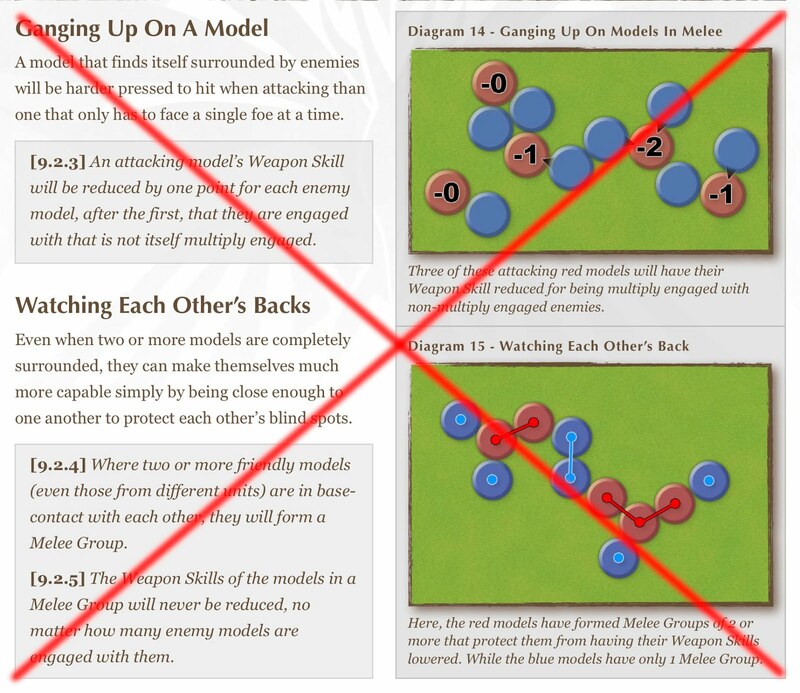 The second issue is that players overwhelmingly wanted their unengaged models to be able to fire freely at other units on the field besides the one they were engaged with. So I'll need to carefully think about when/if that should be able to happen. Needs to be half-movement instead of 8" or some other pre-defined number. I've never been able to come up with (or heard anyone suggest) an Overwatch rule that didn't seem like a messy kludge. But watching the action on the table during the games, it really struck me that units with low Initiatives really needed some kind of way to get the drop on high-Initiative units. Players really wanted some kind of reaction fire when being charged. So what I'm thinking is that a unit can declare Overwatch in the Action Phase (and do nothing), in order to be able to shoot in the Movement Phase when they're selected. That way a low-initiative unit can get a chance to fire at the high-initiative units before they get to move out of the way. Simple! And it would potentially discourage high-Initiative units from simply running in the open towards a healthy unit, assuming that they'll automatically get a double-move and a charge before the lower-initiative unit can react. So we get a kind of "defensive fire" rule without having to add a bunch of edge-case rules (or require extreme rolls) in order to make it happen. That's it for the big stuff. I've got 2.5 pages of notes that include other half-formed ideas, but I don't feel like they're worth talking about in detail. Since they may never see the light of day. But... We did have a real hero-moment in one of our games! If you look closely at that pic of Alex at the top of this post, you'll see a clump of troops half-hidden (oops) by a tree obstacle. That was a game that run 8 turns (in an hour and a half), where it came down to his marine lieutenant vs. a unit of fallen conscripts. Both armies had lost more than half of their units, and thus had to make Strike Force Morale Checks to stay on the field. But when both sides fail their rolls, and there's a tie, the game continues. Well, this one continued for 3 turns as his lieutenant tried, vainly, to hack away at the blob of men around him, and they tried (vainly) to try and penetrate his armor. But in the end, he finally passed his STM check, while I failed mine. So his last man standing took the field as the conscripts fled.